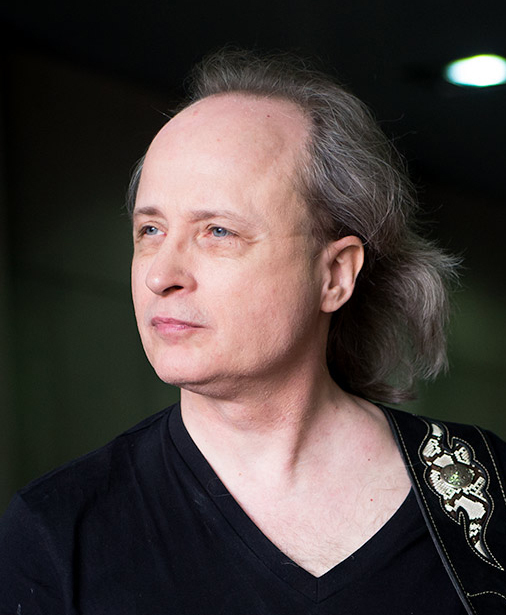 Bruce Arnold (born 1955 in Sioux Falls, South Dakota, USA) is an author, composer, educator and guitarist residing in New York City. His explorations into the applications of 20th century classical theory in contemporary forms such as Rock and Jazz has created a unique compositional and improvisational sound. As a guest artist Arnold has toured Australia, Canada, the Caribbean, Europe, Japan, Mexico, Russia and the United States. His performance and recording activities include work with a wide array of styles. He has played with such diverse musicians as Stuart Hamm, Peter Erskine, Joe Pass, Joe Lovano, Lennie Pickett, Randy Brecker, Stanley Clarke, the Boston Symphony Orchestra and the Absolute Ensemble under the baton of Kristjan Järvi. Bruce Arnold’s recording credits include over thirty five CDs and DVDs (on Muse-eek Records, MelBay Recordings, Truefire and other labels), ranging from the standard jazz repertoire to free improvisation to the reinterpretations of classical music with the ensemble Spooky Actions. His compositions are published by Muse Eek Publishing, and MelBay Productions. Mr. Arnold’s theoretical works have explored the use of Pitch Class Set Theory within a improvisational setting. He is also written more than 300 music instruction books covering Guitar Pedagogy, Ear Training, Music Theory and Time Studies. Bruce currently teaches at Princeton University and has taught at New England Conservatory of Music, Dartmouth College, Berklee College of Music, New School University, and City College of New York and NYU.